We store a lot of emotions in our body. When you have an emotional reaction, whether it’s good or bad, your body reacts to it. It moves, it feels and it experiences. If you have practiced yin yoga for a long time, you may be familiar with a rush of emotion that sometimes greets you in a deep pose, or after the practice in Savasana. Yin yoga poses stimulate the meridian lines which run through the major organs in the body. Different emotions are stored in different places in the body, and when we work through the layers of the body, we work also through the layers of our emotions. Hips carry a big share of these stored emotions, so hip opening poses can be challenging and releasing at the same time. It's good to test yourself, to find your edge, but never move beyond this into severe discomfort or pain. Continue with kindness and always respect your own limits both physically and emotionally. Start in Child's Pose with your knees apart. Breathe deeply and allow your body to come to rest. This is a great way to come to your practice with peace and ease. It's also a great opportunity to remind yourself of or set an intention. For Frog Pose, you may want to place towels or flat pillows under your knees for protection. Start in Child's Pose, spreading your knees outwards. Keeping your toes together, lift your hips to be aligned with your knees and stay in this Half Frog for 2 minutes. After 2 minutes, if you feel comfortable, separate you heels and come into the Full Frog for another 2 minutes. In the Full Frog your heels are as wide as your knees. You can move the hips slightly past your knees in case the pressure is too much on the hips. Bend your arms and rest your forehead on your hands for ease on the shoulders. Frog is a very deep hip opening pose, especially for the adductors. To come out of the pose, either come slowly back to Child's Pose or slide forward so that you are laying on your stomach. The Shoelace gives a nice opening to the outer areas of the hip. To come into it, start on all fours. Then bring the right foot over the left one, spread the feet, and slowly sit between the feet. Your right knee is on top of the left knee. If there is any pain in the knees, you can sit on a block to elevate the hips. Sit upright, or if you want a deeper stretch, fold forward as far as needed to feel your edge. Stay in this pose for 4 minutes per side. To come out, straighten your upper body, then slowly lean back and straighten your legs. Take a few breaths here before switching sides. If the Shoelace is too uncomfortable, you can lay down on your back, placing the right ankle above the left knee. Taking a hold of your left shin, you'll feel a stretch on the outer right hip and thigh. To come into Dragon Pose, start from all fours and step the right foot between the hands so that the knee comes above the heel. Your hands can be on the floor or on your right thigh. For a deeper stretch, you can place your hands inside the right foot and lower your elbows on a block or on the ground. Hold the pose for 3 minutes and then move slowly to the next pose which is the yin yoga version of the Pigeon, the Sleeping Swan. Keeping the left leg behind, place the right knee on the floor so that it's close to the right edge of the mat. Your right ankle comes close to your hips. Make sure there is no pain in the knees. Center yourself so that your weight is even. You can support the upper body with your elbows or lower your upper body completely on to the floor. Stay for 3 to 4 minutes. To come out, bring your upper body up first, tuck the back toes under, and come up to Downward Dog for few breaths. When you feel ready, come back down to all fours and bring the left foot between your hands. Repeat the Dragon pose and Sleeping Swan on the left side. 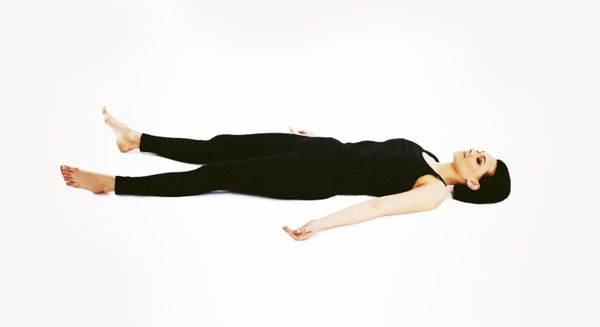 Before Savasana, lay for 3 minutes in Reclining Bound Angle. Lay on your back, bend your knees, and bring your feet close to your hips. Let your knees drop open and bring the soles of our feet together. Let your hands rest on your side or on your belly, and allow the gravity to create space in your hips. To come out, help your legs back together with your hands and straighten the legs to come to Savasana. Lay flat on your back and feel as your body weight sinks into the floor. Let your breath return and feel the new energy your body has gained from these hip openers. Take your time and enjoy! With these poses you can practice remaining still, and at the same time, you allow your body and mind to open up to life. Examine what comes up during your practice and try to remain an observer. Yoga can gently shine a light into your shadows so that you can see them, accept them, and learn to love them.